Seawalls are defined as embankments that prevent the erosion of a shoreline by a body of water. The purpose of a seawall is to prevent the natural erosion of a shoreline by a body of water. A well-constructed seawall can last for many, many years. Contact us to get started and learn more about what we have to offer. Our 40 plus years of experience in the Marine industry make us proud to provide the best quality goods and services around today. Rip rap, ACQ double pressure treated pro-wood or low maintenance vinyl. • Rip rap - Rip Rap seawall construction. The rip rap (rock) is used to protect the bank. Georgia Power requires rip-rap along the base of all seawall projects as it helps reduce undermining and restores shoreline habitat. • Wood - We use ACQ double pressure treated wood for all of our seawalls and docks. • Vinyl - A vinyl seawall will last longer than traditional seawall materials and gives a uniform look that holds up against the elements. Bulldog Marine stands behind their service and materials with over 40 years of marine experience. 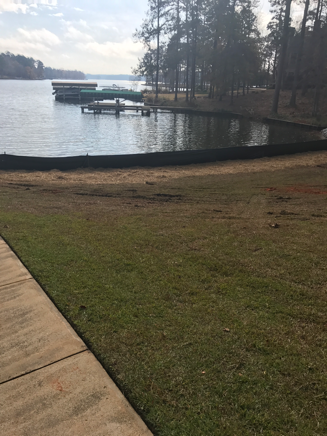 We adhere to strict construction guidelines and will ensure proper erosion and sedimentation controls are implemented. We are proud to have long serving employees who provide the highest quality goods and services. When you chose Bulldog Marine, you're choosing quality and experience. Contact us to get started and learn more about what we have to offer.